You didn’t read this in the daily newspaper or see it on TV, but the Bill of Rights no longer has the force of law in our society. It is effectively dead. As a result, we are all right now living in a dream world that is about to explode in a frenzy of official roundups and ideological repression. How do I know this, especially since I wasn’t told about this problem by the corporate media? Well, it’s the little things that I observe around Albany. Add up all of these details and the sum total is a sinking sensation in the pit of my stomach, a feeling I’d like to ignore. But I can’t. It’s easy to get confused by the decline of our nation’s political system, and by the blatant misinformation that we are being fed by the corporate overlords. So let’s take a moment and dwell on one prime example. One morning this past week I traveled to the City of Schenectady, as part of a field trip by the Buildings and Codes Committee of the Council of Albany Neighborhood Associations (CANA.) We were meeting with the two public servants who are in charge of Schenectady’s code enforcement deep inside their marvelous City Hall on Jay Street. We were impressed by our hosts’ openness and honesty, which was in sharp contrast to what we regularly encounter here in Albany. But that’s not what I want to tell you about right now. You see, I was even more impressed by the main entrance of Schenectady City Hall. Or more precisely, what wasn’t there. I walked right off of Jay Street into City Hall without having to go through a humiliating and unconstitutional search and seizure session at a police checkpoint. No one bothered me. Within seconds I was wandering around the building unescorted, looking for the room where our committee was supposed to meet. What a wonderful sensation to enter a public building without being threatened! No police officers or security guards illegally demanded that I empty my pockets for their voyeuristic pleasure. No puffed up little instruments of government suppression were on hand to treat me like an untrustworthy third class piece of dirt. Thanks to Mayor Jerry Jennings, this is the sort of reception we taxpayers have regularly received at the entrance of our Albany City Hall since 2000. Every time I have to go down there I am astounded to see people stand waiting in line like sheep at the doorway checkpoint. And I have no choice but to join them. With our taxes we are paying Albany police officers to break the law and violate our bodies and fondle our property. It’s even worse two doors down at the Albany County Courthouse. The Sheriff’s Department is down in the basement, thus the building is a virtual armory crawling with deputies with full powers of arrest and licenses to kill. Anyone who might attempt an armed invasion of the premises would end up a bloody pile of meat within minutes. But first the armed invader would have to get past the County’s rude and nasty security guards at the front door checkpoint. That would take, I suspect, a matter of seconds. I must admit I’ve always gotten a grim laugh from the idea of all these County Cops cowering in the basement with their array of weaponry behind several low paid unarmed security guards. As a former security guard I can tell you with certainty that these people blocking the entrance of the County building do not guard anybody and they provide no security. They are not only unqualified to conduct searches, they have no legal right to do so. Ever. Perhaps they are placed out on the “front line” because they are expendable. Over at City Hall we are actually better off with real cops at the front checkpoint. At least they have a more professional attitude... most of the time. And unlike security guards, real cops actually have a limited privilege to conduct searches and seizures under certain circumstances. Or, their privilege used to be limited back when we still had the Fourth Amendment. So what is the official justification for Jerry Jenning’s police checkpoint? The only Al Qaida “terrists” in Albany exist in the strange minds of the Federal secret police. Happily, we rarely hear any more about how the City Hall checkpoint is “protecting us from terrists and jihadis,” except from idiots. Last I’ve heard, Schenectady has a higher rate of violent crime than Albany. But even though their City Hall was wide open to the entire world the morning that I visited, I did not hear of or witness one violent act the entire two hours that I was there. And believe me, I searched. I must of wandered around for ten minutes before I found the room where I was supposed to go. As for Albany, those of us who live here and pay attention to such things know that the local media and the suburbanites that surround us have a massively exaggerated perception of violent crime in our community. Yes, we have crime, and any at all is unacceptable. But the level of violence in my neighborhood is hardly great enough to cause me to barricade my house and tremble behind an alarm system like they do out in the suburbs. 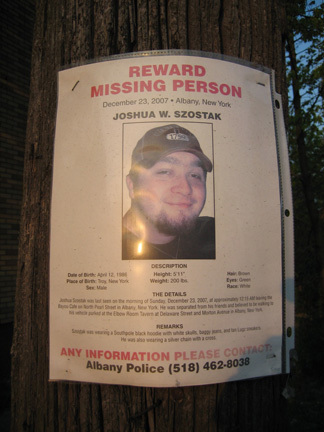 For example, take this unfortunate kid from Latham, Joshua Szostak, who disappeared one night after heavy drinking in downtown Albany. The local corporate media was full of lurid headlines that went on for weeks. Abducted! Kidnapped! Robbed and left for dead! The repeat message was loud and clear. Albany is a dangerous place full of dangerous people who eat visitors alive. Stay away! Well, the other day they found the kid’s badly decomposed body in the Hudson by the boat launch in Coxsackie. He still had his wallet containing four hundred dollars. We’ll never know absolutely for sure, but it looks like he drunkenly wandered down to the river and fell into the cold water all by himself. Too bad, but stuff like that happens sometimes when you use powerful drugs like alcohol. In sharp contrast to the initial headlines, the news that Joshua Szostak died by accidental drowning was buried and treated incidentally. This left the lasting impression that some of us who live in Albany robbed him and took his life. The Hearst Times Union reported the results of the autopsy exactly once, in Section B. This is one of a cavalcade of reasons why I despise the corporate media. Okay, fine. For purposes of this discussion I will concede the point without argument. Someone may want to bring a weapon into the court room and use it. After all, some of these people going in there are indeed criminals. And no one likes to hear an unfavorable verdict. But wait a minute. 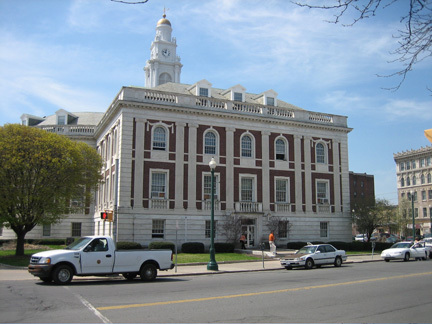 The Schenectady City Court is on the second floor of their City Hall. And guess what? They have a checkpoint with guards and a metal detector at the entrance to the courtroom, a checkpoint which is only used when court is in session. When our meeting with the codes officials was over a little after Noon, we stood around for a moment next to the courtroom checkpoint. 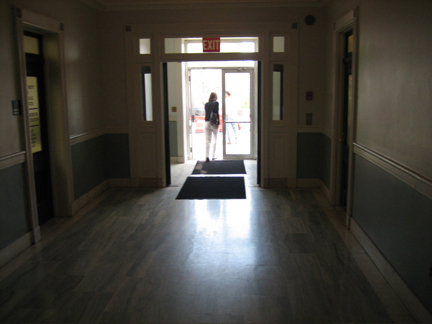 It looked like court had emptied out recessed for a lunch, and a lone guard sat at the desk next to the metal detector studying a magazine. When one of our group wandered behind the guard to peer into the courtroom, the guard never looked up. With the example of Schenectady in hand, we are forced to conclude that the police checkpoint at the front door of Albany City Hall serves absolutely no security purpose. Anyone who insists that it does is deliberately spewing forth what a bull leaves in a field. It is clear to me that Jerry Jennings has erected this unnecessary police checkpoint merely to shock and awe, to threaten and intimidate. After all, you may recall that this checkpoint was set up at the front door BEFORE the events of nine eleven. Yet somehow, local police harassing us taxpayers at the entrance of our City Hall is supposed to make up for the massive security failures on a Federal level that allowed the 2001 attacks to happen. Like most if not all checkpoints of this sort, this one leaks like a sieve. If every single person was searched in exactly the same manner every single time he or she entered Albany City Hall, then I might be less inclined to criticize. But of course, the intensity of searches is based on class and racial profiling. Go watch the City Hall or County checkpoints at 8:30 AM if you don’t believe me. So then if the Albany City Hall police checkpoint serves no constructive purpose, it becomes nothing more than an expression of the prevailing attitude of our City government. The clear message is that our elected officials lack confidence in their own legitimacy. We are left with the image of Jerry Jennings cowering behind a door, terrified of the citizenry. But an even sadder image is the lines of compliant citizens waiting to be searched. No one questions the intrusions, no one files lawsuits. No one stands firm for the Fourth Amendment. Only lone nuts like me rail against bland acceptance of these pointless violations of our precious American freedoms. I suppose it is too much to hope that our next mayor will dismantle the front door checkpoint, or move it upstairs in front of the courtroom where arguably it might serve a purpose. Politicians, with few exceptions, are not renowned for their common sense. They need to be constantly reminded of the difference between right and wrong. Only public pressure can restore open public access to City Hall. I don’t see that happening. Perhaps my fellow Albany taxpayers are too scared of The Mayor, perhaps they don’t care, perhaps they like being searched. Perhaps there’s nothing any of us can do except stay home and wait for the police to kick down the door. Um, you might want to reconsider what you said about Josh. I am sure your saying it because he is from the burbs. Over the pasy 10 years, we have seen the same exact thing happen over and over again in college towns. A Young kid dissapears, missing for months, then his body washes up on shore. All of these have been treated as just a case of a drunk kid. Well, your wrong, is it a coincidence that Josh and the kid from Middelbury college went missing around the same exact time. How about the fact that a drunk kid wouldn't walk 8 miles to the port of Albany and just jump in. I was there that night and he wasn't as drunk as you make it. Look into the smiley face killers, and you will see, this was not what you think it was. Hey Suburbanite- Eight miles to the Port of Albany? You might want to check your facts, not to mention your geography, before you come to any conclusions. Why close the case so quick, I mean there have been 40 similar examples of this kind of disapearance over the last 10 years. We also had a kid go missing an hr away in Middlebury a month later. Why is it so hard to believe that this could be some sort of multi state murder ring. I mean his body was dumped in the water for 4 months and decomposed. Its the perfect crime, all the evidence washes away. Two ex NYPD officers are researching this now. I am just saying, it seems like such a coincidence that all of these kids are dying the same exact way, same exact profile, etc etc. Please tell me why he left his cell phone, stole a car and then jumped in the river. He was 21, I am sure he has dranken many times before. Why in gods name did he go to the port. People aren't looking at the larger picture here, 40 people have died the same exact way over the last ten years. One was in Canton 2 years ago, and then a month later another kid an hr north of Albany went missing the same way. 10 years ago, a kid from Fordham went missing, the same exact way. In fact, the police said he was drunk two until the two officers proved it was foul play. I think were doing Josh's family and many other potential victims a big diservice assuming this is a closed shut case. "He still had his wallet containing four hundred dollars." Right. An article came out today (4/29) in the Hearst Rag that stated that the wallet did not contain $400, it only contained less than $30. The Hearst writer blamed the misinformation on the State Police. This is the first suspicious bit of information I've heard. If the State cops did indeed give out this piece of misinformation initially, well, that's quite an interesting mistake, don't you think? Was it deliberate? 1. the initial headline is what everyone will remember, not the correction. i'm sure the police are well aware of that little sociological phenomenon. 2. there really might be something to this "smiley face killer" aspect of the szostak case. it's really too strange of a parallel to dismiss outright. guys, really. a national gang of killers? I feel sorry for the Szostak family. But I think they are reaching for something thats just not there. In 2001 there were 4,500+- young men under the age of 21 that died in alchohol related deaths. I am sure that among those 4,500 you will find some astounding simularities. But it isnt proof of anything. As for Fort Apatchy on Eagle Street, the police are needed to keep angry tax payers out. I have to agree with Alfred as usual... I'm sure there are a many similarities. Alcohol can make people who wouldnt otherwise do certain things, do them. The Smiley Face Killers are an invention of a couple of kooks on late-night radio. They fit a segment in every now and again between the Roswell UFO mystery and bigfoot sightings. Young men tend to drink too much in public. And drinking often leads to mysterious accidents. There is a patterm, every month there is another kid age 21-25 who is at a bar and ends up drowned. I saw the face and I can tell you it looks like its been there for a while, there is no way it was painted recently, go see for yourself. So tell me this, I never heard of anyone drowning in Albany and when I was in college back in 1998, people drank allot more. Why is it now that all of these young men are falling into rivers. Why is it that in a matter of three months, three kids died the same exact way all within 100 miles of each other. I can't believe that you all think Josh died that way, none of you knew him. I had gone drinking with Josh on many occasions and he did not drink to the point of losing control, he would never do that to his family. Why is it that the APD closes the case before his toxology report comes back. How can they tell if he was drugged or not. They say they have a video of him, show us then. Even more disturbing is this. In Wisconsin a kid awoke near drowning in the Missipi River. He didn't know how he got there. Even funnier was the fact that his BAC was .04 far far far from drunk. Somehow he blacked out and wound up in the river right. You people sicken me and pray to god that something like this happens to your kids. You would want answers but all of the arm chair quaterbacks say your kin died drunk despite the fact that all of the evidence shows something else. If these detectives are such kooks why is it then that a Congressman is lobbying to get the FBI to reopen these cases. 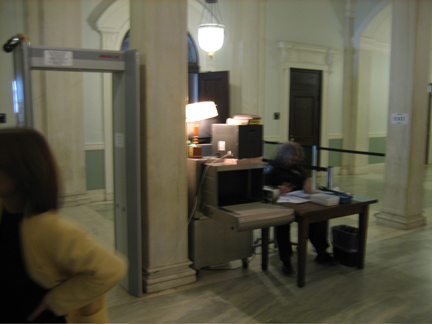 The security theater at state, county and city buildings in Albany is essentially a jobs program. My experience with this was going to the Legislative Office Building last year, and having the "security" people steal my small Swiss Army penknife/scissors combo. There were literally six guys, presumably on the state payroll, manning the checkpoint at the northern end of the Empire State Plaza concourse, and only one or two were actually "working" at stealing my penknife. While I was arguing about the impending theft of my penknife, a dozen or so people passed through a special gate for LOB/Capitol workers, while the "security" force twiddled their thumbs. As if none of those people would have no reason at all to go postal at work. Gov. Paterson is evidently looking for budget savings by eliminating unnecessary jobs. He can start with the absurd "security" force "guarding" the Capitol and the LOB. Maybe the TU can have its student investigative reporting staff FOIL this "security" operation to see how many terrorists, or real weapons, have been kept away from the seat of state government.